I spent last weekend in one of my favorite Northern California getaways, Mendocino. Approximately four hours north of San Francisco, this coastal town is heaven for anyone who really wants to escape the Bay Area rat race. Its buildings and sidewalks harken back to the gold rush era, although it’s really an old logging town. Mendocino was founded in 1850, and has a population of just over 800. My two-cents: Avoid staying at higher-profile spots like McCallum House or the Mendocino Hotel. They are OK – very pretty old buildings — but a little too self-congratulatory and a LOT too expensive. The Mendocino Hotel in particular has only so-so food, and spotty service in the lobby bar. The smaller inns flat-out try harder — particularly with today’s economy. Wireless reception in the Mendocino area is mercifully sporadic, and chances are you won’t have a TV in your room. Each night I followed the Giants on my alarm clock radio, and then grabbed dinner at one of the great restaurants in the town. Unfortunately, it was the foggiest weekend I’ve experienced in Mendocino, so I don’t think my photos do it justice. Still…. I didn’t go to Mendocino JUST for relaxation. My mini vacation was timed to coincide with the 85thAnnual Mendocino County Fair & Apple Show. While there, I ate a hot dog on a stick and drank apple cider, and admired adorable kids in cowboy boots. I petted many sheep and goats, and a couple of cows. I also experienced my first rodeo. The California Cowboys Professional Rodeo Association (or, CCPRA) Finals, to be precise. As I took photos, my fellow spectators naturally assumed I was a rodeo buff. This made me enormously proud, although I eventually had to confess that I had no idea how any of it worked. The cowboys were handsome and rugged, but the truth was… I was always quietly pulling for the calves. After dodging the lasso, they would dart around the arena until someone managed to drag them back to the pen. Those calves always looked a little smug, frankly. 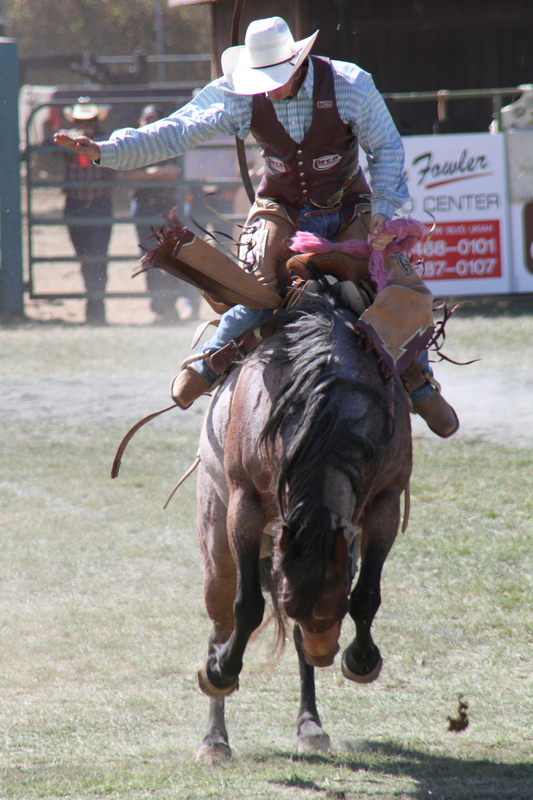 My photos are pretty amazing — not because of my photographic talents but because rodeo is an intense and violent sport. Pay special attention to the horses. I think it’s safe to say, they don’t want to be broken.